White Rim Road Scenic Drive, Utah | Classic Desert Road Trip Route! This fabulous scenic route is approximately 100 miles in length and takes between two and three days to complete if you are driving an offroad vehicle. It’s important to understand the driving conditions and terrain since this will directly affect the kind of rental car you choose. 4WD vehicles are the only way to go since ATVs and similar vehicles are not permitted. Some of the top activities include hiking, climbing, horseback riding and stargazing. Hiking and climbing is a great way to make your way around while getting some exercise. You can stop along the way and take in some of the most spectacular views. Horseback riding are also a lovely way to explore the area while your sure-footed friend does at least most of the work while you enjoy your surroundings. If you aren’t too familiar with the area, there are tour companies available and this is one of the best ways to really make the most of your trip. At night, because you are so far from towns and cities, you will be able to appreciate the night’s sky like never before! Set out your blanket and take a seat or lay down as you let the stars amaze you. If you are unable to hire a 4WD vehicle or you aren’t completely confident in your offroad driving skills, then you can enjoy an easier route called the Island in the Sky route. 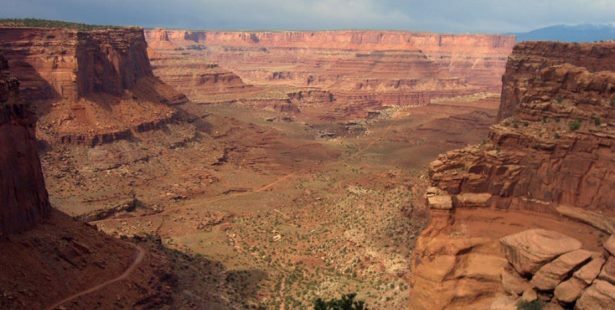 Along this route, you can enjoy trails like Mesa Arch, Upheaval Dome and Aztec Butte. The Grand View Point is also quite easy to access. Of course, the best experience is along the White Rim Road. The views are even more spectacular and this route is also rated intermediate and not quite as difficult as routes like Elephant Hill. Remember to always stick to the routes and drive carefully. If you do require a tow, it can be rather expensive so keep this in mind before attempting anything beyond your level of experience and driving ability. Nearest main airports where you can pick up your car rental are at Salt Lake City, Utah; Denver, Colorado; Las Vegas, Nevada and Albuquerque, New Mexico. Take a one way rental between any of these locations to explore more of the region. You should also remember to take plenty of supplies along with you since the area is pretty deserted apart from fellow tourists and perhaps some local tour operators. Take enough drinking water and food that won’t spoil as well as a first aid kit and plenty of clothing for all weather conditions.